9. Biosynthetic Insights of Calyculin- and Misakinolide-Type Compounds in "Candidatus Entotheonella sp." 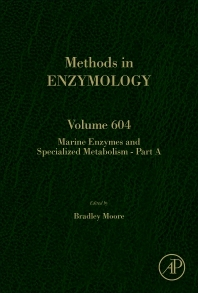 Marine enzymes and specialized metabolism - Part A, Volume 604 highlights experimental methods on diverse marine enzymes involved in the construction of bioactive natural product molecules. These detailed protocols are written by experts who actively study and apply marine enzymes in biosynthesis and biotechnology. Comprehensive chapters in this latest release cover Chemoenzymatic synthesis of starting materials and characterization of halogenases requiring acyl carrier protein tethered substrates, Assaying biradical aryl coupling activity of CYP450 enzymes, the Characterization and application of marine microbial omega-3 polyunsaturated fatty acid synthesis, Catalase-related allene oxide synthase: on a biosynthetic route to fatty acid cyclopentenones, Haloalkane dehalogenases from marine microorganisms, and more. Bradley S. Moore is a Professor at the Scripps Institution of Oceanography, Skaggs School of Pharmacy and Pharmaceutical Sciences, University of California San Diego.